Hello…Happy Monday. I hope everyone had a wonderful weekend. Well, if you saw yesterday, I overdosed on Home Goods and Michael’s! LOL So today I had to find places for a lot of stuff! I started with the Foyer/Entryway. 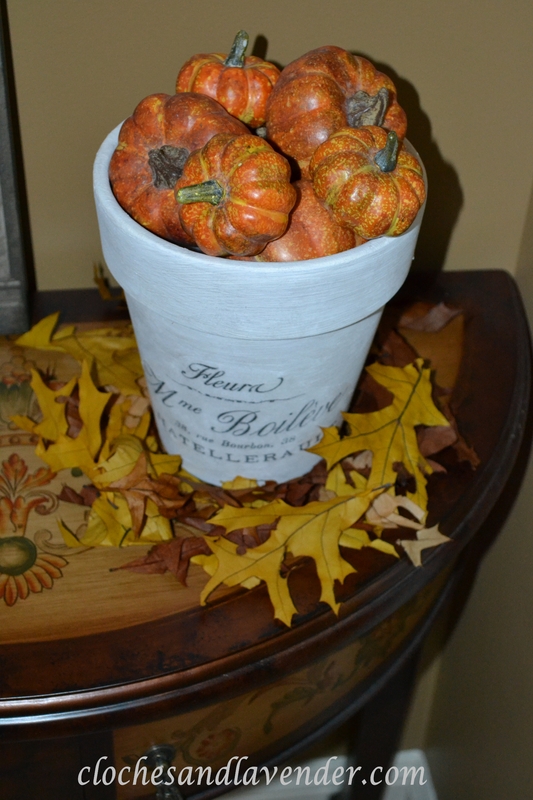 I decided to fill one of my French pots with some small pumpkins I had for a few years and surround it with leaves. 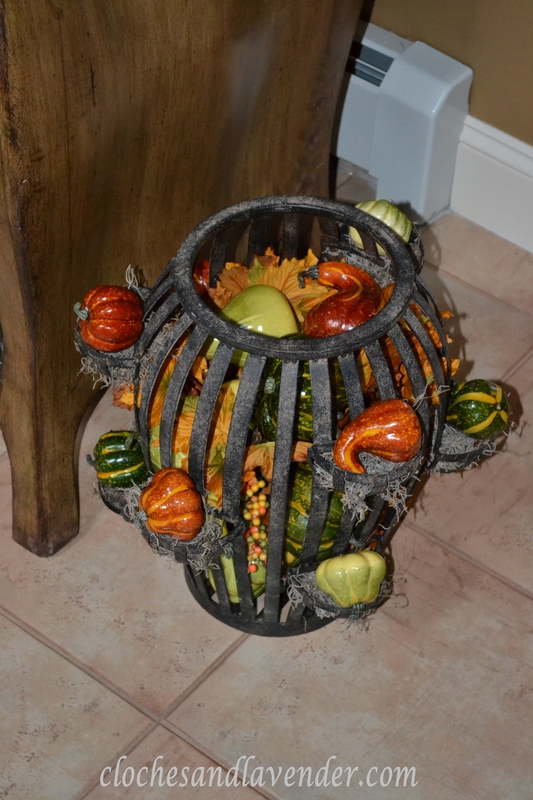 The other table that I recently painted with Annie Sloan paint has a pedestal with pumpkins I purchased from Michael’s and the pot with the straw inside I just made with a graphic from The Graphics Fairy and straw pieces I purchased at Michael’s. 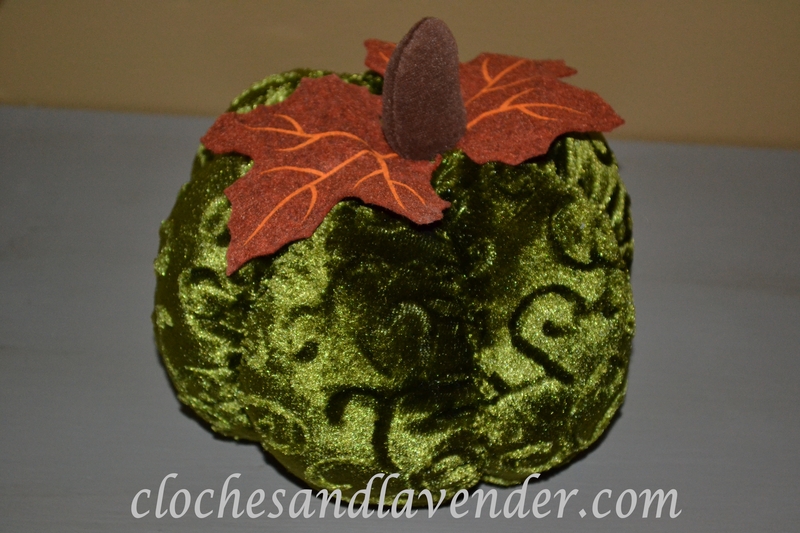 The one other item on that table, I purchased from Michael’s at 50% off, is a velvet pumpkin. This metal piece next to the Bombay chest is a discarded strawberry pot that I found for free! I purchased pieces from Michael’s at 50% off to place inside along with some Spanish moss I had on hand; I figured it would be a great repurpose and it can change throughout the year. The bowl on the Bombay chest is filled with gourds I purchased from the garden center in town. The small pumpkins near them are from there also. Looks greta! Love that strawberry pot (with or without the pumpkins) and the glass mini pumpkins are so cute. You’ve inspired me to finish mine!! I love your fall accents! So pretty! 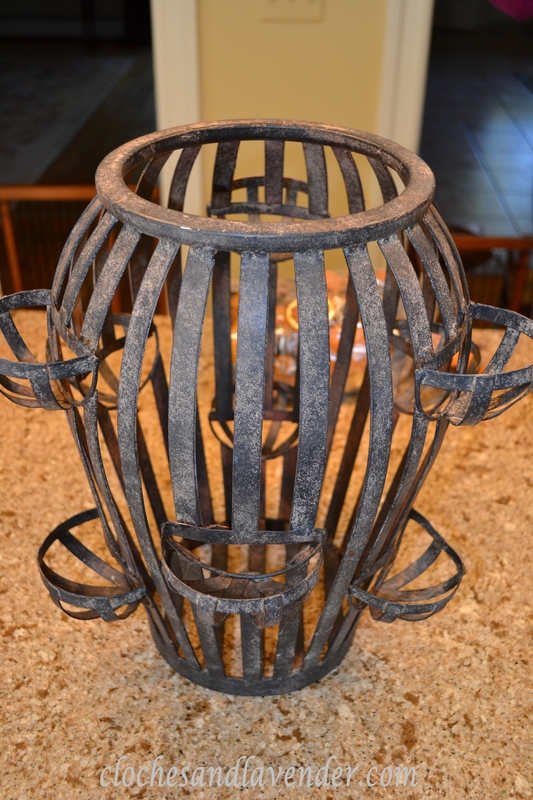 What a great idea…I so love it!….Your foyer looks so beautiful!!!…. Very cute! Great ideas! Love that discarded Bombay strawberry pot find! So cute- and it has many possibilities for more uses! 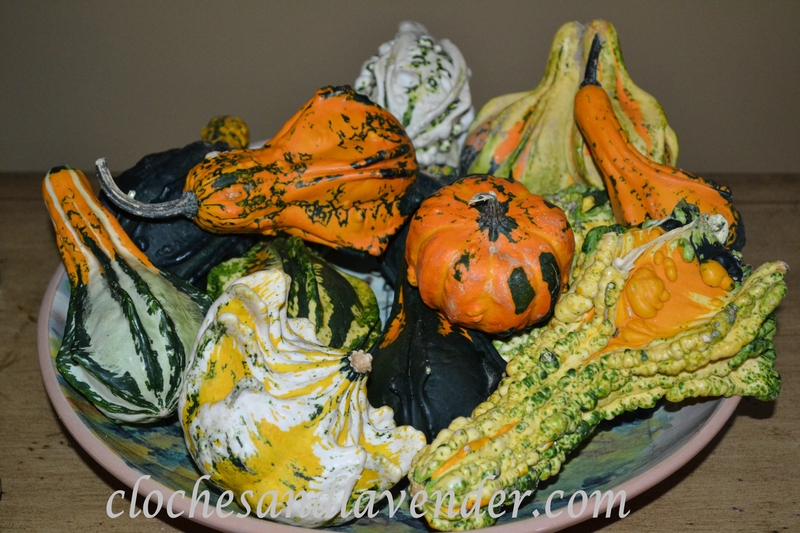 Don’t you just love all the fancy gourds that are available these days! Yes I do. 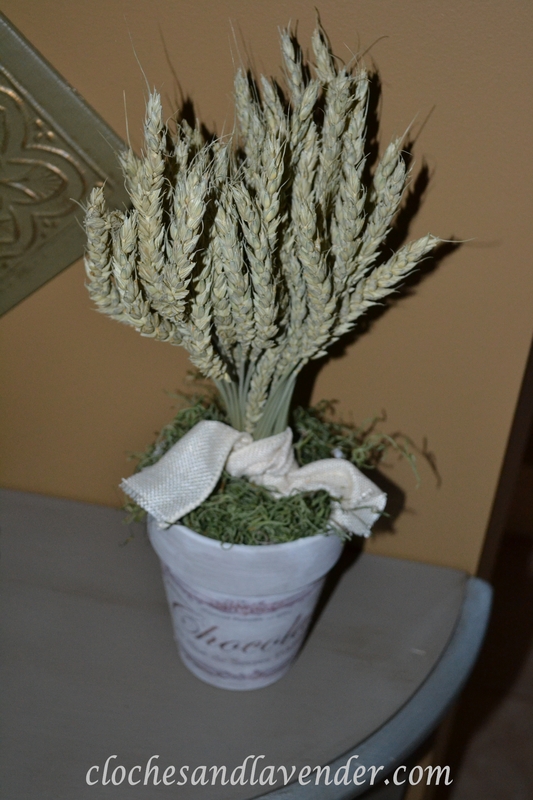 I am thinking of how I am going to ust the strawberry pot for Christmas now. Thanks so much for your kind comments. Beautiful! Fall looks stunning in your home. Thanks so much there is much more to come. Everything looks really great! 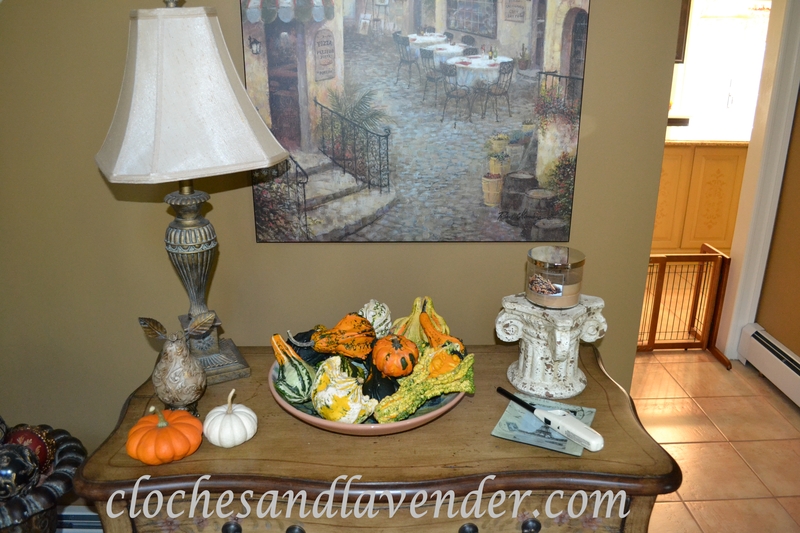 Love the small pumpkins and gourds, probably especially since I did similar things with our fall decorating. Really love what you did with the old strawberry pot! 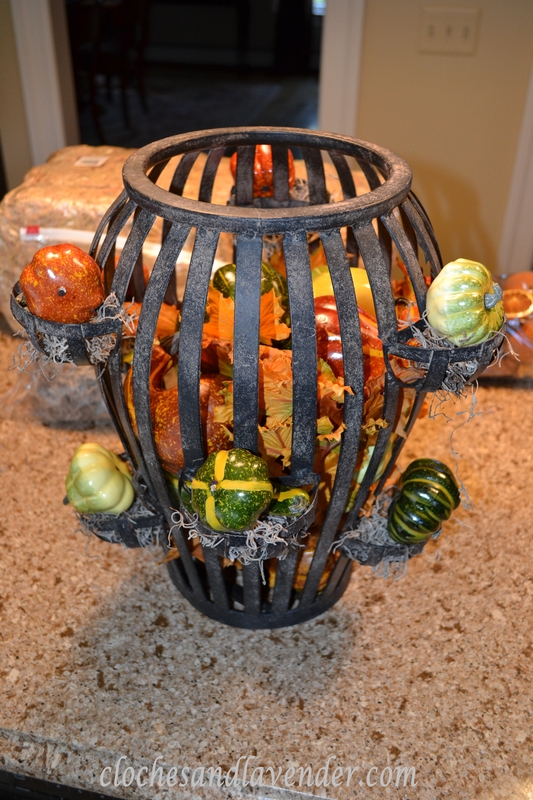 Such a clever use with the mini pumpkins/gourds used and leaves in the middle!! Thank you so very much. It is so good to hear from you. I really like what you did with the strawberry pot! What a great find just getting readfy to go to the garbage. The iron is in perfect condition. That looks fantastic! and I love that strawberry pot. Pretty decor! Thanks for the visit and the wonderful comment. Love the metal strawberry pot! Your entryway looks lovely all dressed for Fall. I’m especially loving that free metal strawberry pot! Thank you paying a visit and kind comment. The foyer looks very festive! What a clever idea for reusing the strawberry pot! 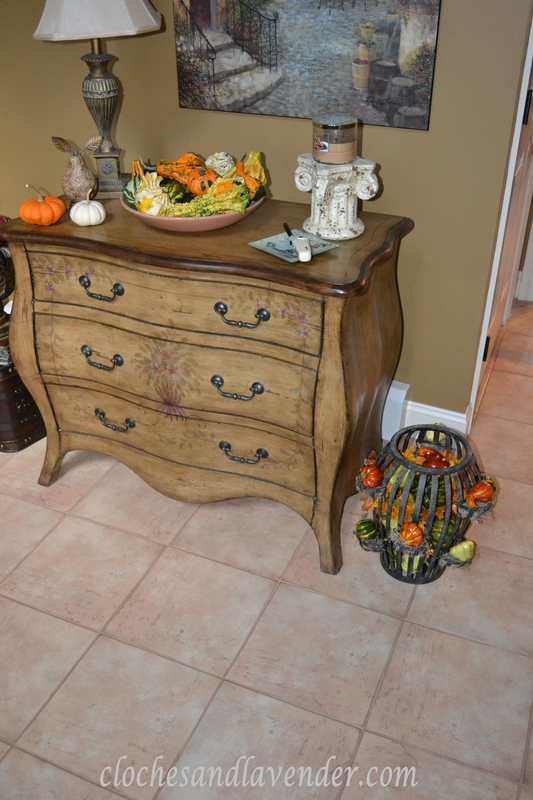 We love how fall just makes everything pop…whether it’s in an entryway, living room or dining room!! Looks like you had a blast decorating! We are hoping to get some done this week! Thank you so much for your kind comments. I have a great time decorating for the holidays and the different times of year. 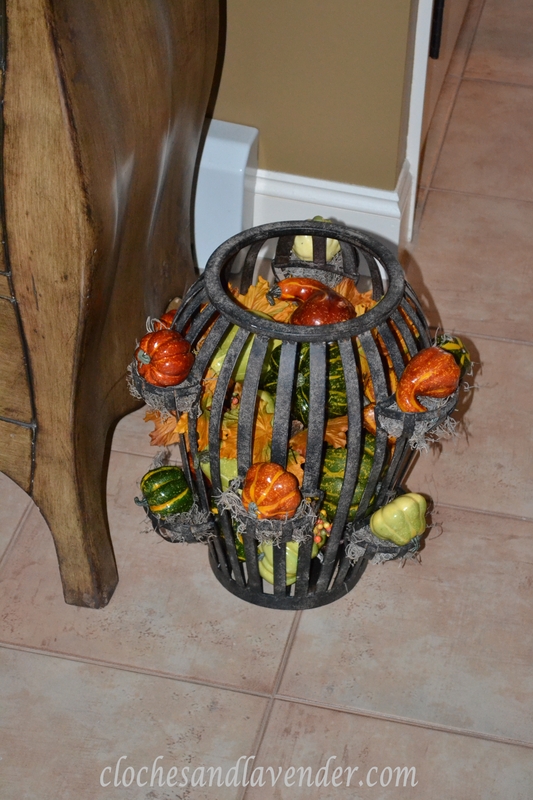 Love your fall decorations – very beautiful! Thank you so much. You guys are so talented, It just blows me away. 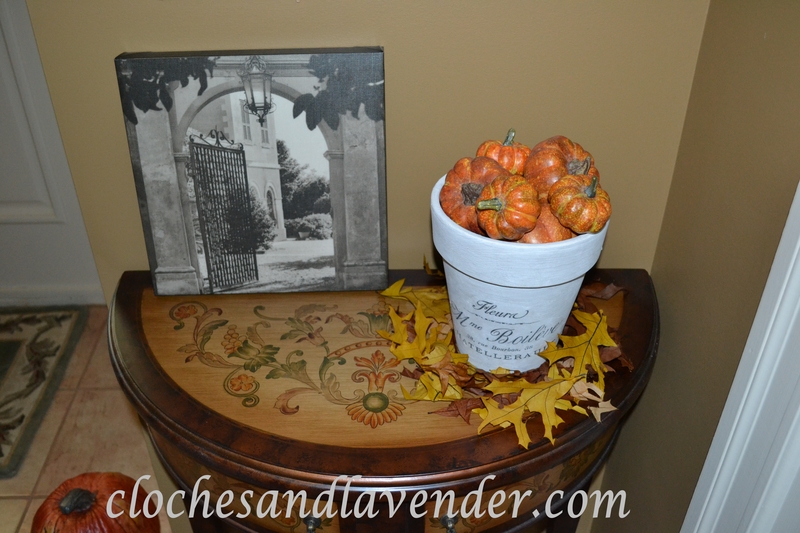 You should see todays post Bits and Pieces of fall in the Great Room. I hope you will follow Cloches and Lavender. Love that strawberry pot. 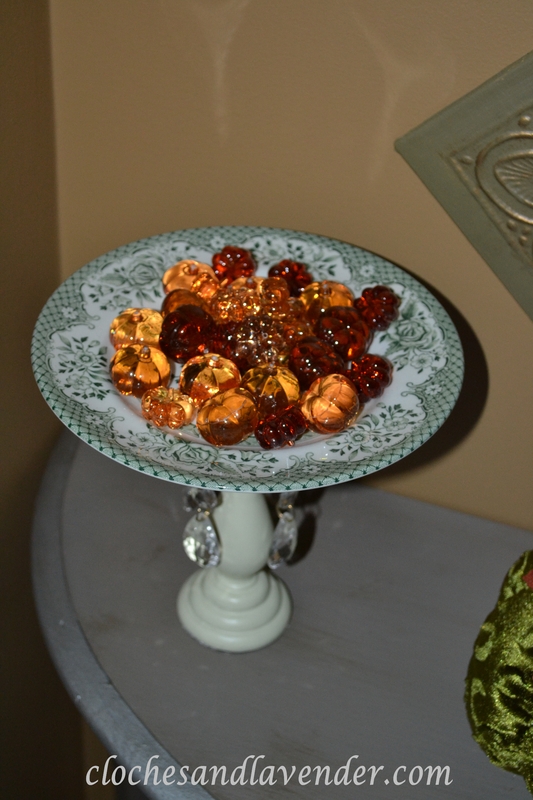 Such a cool thing to use in your decor. Thanks for sharing at the All Star Block Party. Thanks so much for the sweet comment. I didn’t know if people would like the strawberry pot but it has been a hit. Wo9nderful fall pot. You have great ideas and are carrying them out very well. I love your display. Happy VTT! Thank you so much, it is a great find. It is in perfect condition. I hope you will follow Cloches and Lavender. Looks cozy! Thank you for sharing this at Rustic Restorations Weekend. What a warm and inviting entry! Thank you. I hope you will follow Cloches and Lavender. 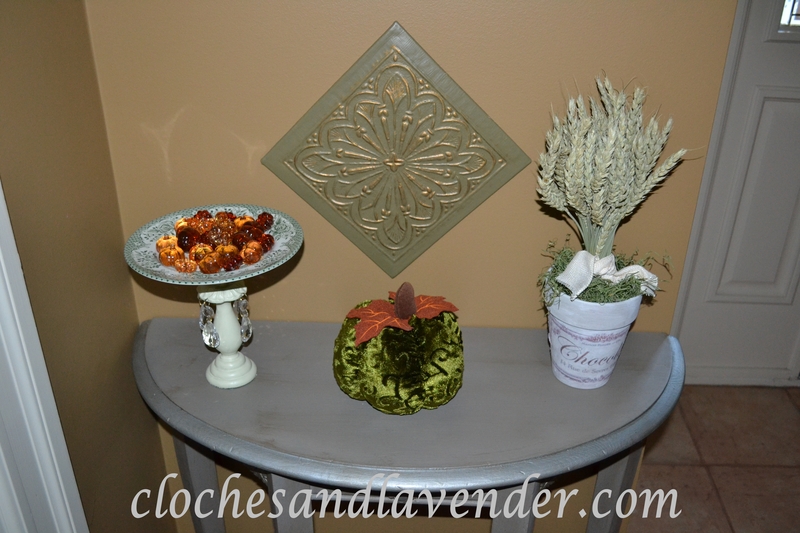 Thanks so much for sharing your beautiful fall foyer on Simple & Sweet Fridays. You are so creative and love all your inspiration for decorating for fall. I know everyone enjoys all your ideas. Always love having you visit on Rooted in Thyme. Thank you very much for your kind words. I appreciate them. Thanks for hosting too week after week. Each of your vignettes are wonderful. You have a very welcoming home! Thank you for joining TTF last week. Hope to see you again. Have a fun day! Diann, thank you so much and thank you for hosting week after week.